February 3rd is Setsubun (節分) in Japan. Setsubun marks the beginning of Spring, according to the Japanese lunar calendar. It’s not a holiday, just special day. There is a ritual associated with Setsubun, which is a kind of cleansing ritual. There is a chant: おに は そと、ふく は うち, which means “devil get out, happiness come in”. The ritual is called ‘mamemaki’ (豆撒き), which means ‘bean scattering’. Roasted soybeans (irimame – 炒り豆) are thrown out of the front door of the house by the eldest man of the house, traditionally. The family member wears a devil mask as he does this, and says the chant. Then, it is traditional to eat soy beans – either one for each year of your life, or one for each year plus one for the coming year. The whole thing is a kind of new year’s ritual. As with all holidays and festivals in Japan, the shops are full of Setsubun goodies, like these ones I picked up at my local supermarket. 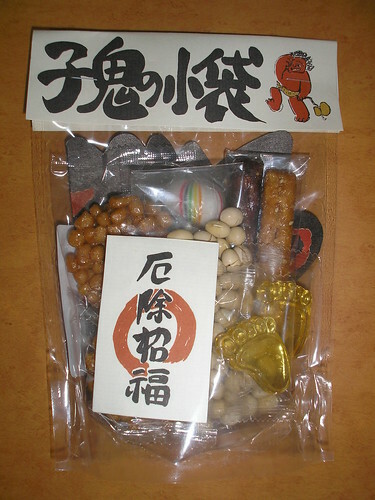 In this pack there is a paper devil mask, some roasted soybeans, and various other sweets and crackers. I especially like the candy feet!